It was the summer of 1992, and Steve McCarthy and his wife were having one of those vacations. The couple had flown to Ireland all the way from Oregon, and rented a car in Dublin. From there, things started promisingly enough. They drove out into the republic’s sparsely populated western reaches, staying at delightful hotels and enjoying the food and—to them—the surprisingly solid wine selections. Then the notoriously fickle Irish weather got in the way. The couple were near the western coast, around Galway, when heavy rains set in, gumming up their travels and those of fellow tourists. Their next hotel was full of guests unable to move on, so the Oregonians were unable to move on. Stuck, McCarthy hit the hotel bar. He ran through its Scotch and single-malt whisky selection as the rain fell in sheets against the windows—perhaps, in the end, the ideal environment for sampling such fare. The single-malt whiskies in particular struck McCarthy for their rich flavor. “This is fabulous stuff,” he thought. He was familiar with the type of spirit. It was hard not to be in McCarthy’s line of work: In 1985, he had started in Portland one of the few independently owned distilleries in the U.S. making spirits in more traditional ways with more traditional ingredients. McCarthy’s Clear Creek—named for his family’s longtime orchard in Oregon—was particularly noted for its eau de vie, or distilled fruit. It did not produce whiskey, much less single-malt, which had come roaring into vogue in the U.S. in the early 1980s. The reason was simple: The rises of fine wine, white rum and vodka—respectively, California wines, Bacardi and Absolut vodka in particular—had decimated the market for blended whiskey from Scotland (or, as the Scots call it, “whisky” without the “e”). What to do with the barley-based whiskey that had been aging since the late 1970s? Sell it in its more concentrated single-malt form rather than blend it (the Scots by and large preferred single-malt themselves—they called the blended stuff “cooking whisky”). One of the things that people invariably knew about single-malts was that they came from Scotland. The whiskeys were the crème de la crème spirits-wise of that Celtic jut. Yet, there was no hard-and-fast rule that single-malts had to come from Scotland. That left an opening for McCarthy; and he filled it in part with beer. After he and his wife finally made it back to the West Coast, he reached out to a fellow Portland purveyor of alcohol: Kurt Widmer, one‑half of the fraternal duo behind Widmer Brothers, one of the oldest micro-breweries in the U.S. outside of California. “Let’s make some whiskey,” McCarthy told his friend. To start, McCarthy imported from Scotland barley that had been kilned over peat, the dense, boggy soil common to the United Kingdom and Ireland, and which distillers there often use to give single-malts that earthy richness that so beguiled McCarthy. Widmer then used that barley to brew a smoky beer. McCarthy took back over and, using the same pot still he used for his eau‑de‑vie, distilled from Widmer’s brew a whiskey that he then put into three types of barrels: two made from distinct species of Oregon oak trees, with one barrel kiln‑dried and the other air‑dried, and a barrel used to age sherry. Around Christmas 1997, after barely three years of aging, McCarthy released a limited amount of what he called McCarthy’s Oregon Single Malt, holding back some to see the effects of more time in the wood. The debut 20 years ago was a watershed in two ways: McCarthy’s Oregon Single Malt was the first American-made single-malt whiskey released in the U.S, and it marked the first commercial collaboration between a pioneer of small-batch spirits and micro-brewing. The only thing that came close in 1997 was the Anchor Brewing Co.’s collaboration with itself—that is, owner Fritz Maytag had launched the Anchor Distilling Co. out of the brewery’s San Francisco location in 1993. The new distillery’s first offering shortly after was a whiskey made 100 percent from rye. It was an approach that American distilleries centuries ago had favored—rye was one of the main whiskeys George Washington’s Mount Vernon made in the late 1700s, for instance—but it had long gone out of style. So the first two comings-together of what came to be called craft beer and craft spirits produced anomalies. They also spawned a trend that ripples through tipples decades on. Any number of smaller brewers have collaborated with smaller distillers on various spirits. Distilleries routinely lend or sell breweries barrels once used to age whiskey, rum, et al, to in turn age beer. In the case of bourbon, distilleries have no need for the used barrels anyway: The law requires bourbon be aged in unused barrels. 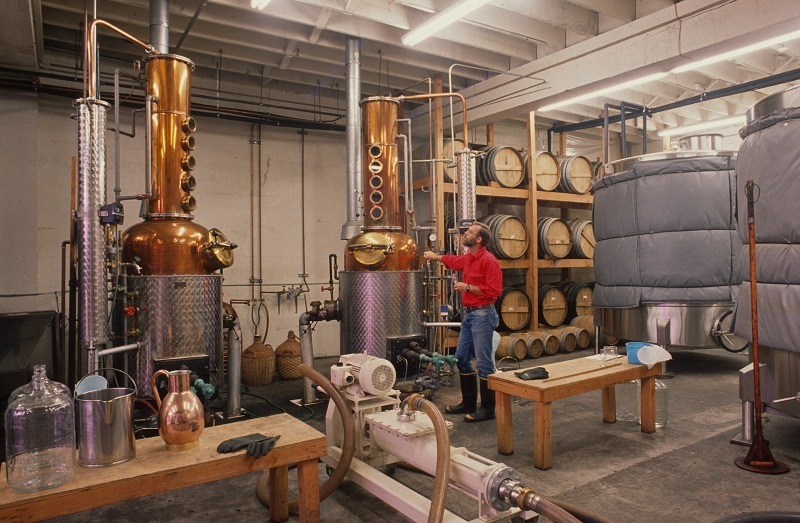 And some breweries, including Massachusetts’ Cisco, Delaware’s Dogfish Head and Oregon’s Rogue, have followed the Anchor route, and added distillation to their mixes, often in the form of independent distilleries. Perhaps the trend is not so surprising, though. After all, the late Michael Jackson—who himself straddled the beer-spirits divide, becoming the most influential consumer writer on beer and whiskey—never tired of pointing out that the distillation of one couldn’t happen without the same sort of mash that produced the other. Pray,how does one procure some of Steve McCarthy,s singe malt in New Jersey,or New York,if needs be.I swear I’ll go mad if I can’t taste some,nay,plenty.My favorite is smokey Scotch,the one I like the best starts with an L but I’ll be dipped if I could remember how to spell it.When one gets to be 80 years of old,well ,you know.